We will have a number of opportunities over the next few days to give thanks for God’s abundance. Last night several of us attended the Turkish American Society of Michigan’s Thanksgiving Dinner. We got to share in fellowship with our friends from Turkey, and help them celebrate the season. Tonight there is the annual Troy-area Interfaith Group Thanksgiving Service, and then on Tuesday evening there is the Troy Clergy Group service. Then on Thursday many will gather with family and friends to share in fellowship, offering thanks for God’s provisions. Let us, therefore, “make a joyful noise to the LORD, all the earth.” Let us “serve the LORD with gladness”; and “come into God’s presence with singing.” Why? “For the LORD is good; God’s steadfast love endures forever, God’s faithfulness to all generations” (Ps. 100:1-2, 5). In past years I might have preached one last stewardship sermon on this Sunday, but we’ve already had our commitment Sunday. So, I’m less tempted to use the parable of the talents to encourage you to turn in your commitment cards. Of course, our treasurer would be glad to receive them if you’ve not yet turned them in. With that out of the way, we can push deeper into this parable, which according to Matthew, Jesus shared just days before his departure. We’ve already heard a story about a delayed bride groom, in which Jesus reminds us to stay faithful to the promise of the full revealing of God’s realm, despite the delay. In today’s parable Jesus again speaks about living faithfully in the time between his departure and the full revealing of the kingdom of Heaven. There is a tendency to simplify parables by turning them into allegories. In this case, there is a tendency to equate the landowner with God, who either rewards faithful stewardship or punishes unfaithfulness. That’s why this parable lends itself so well to a stewardship sermon. Preachers can use it to guilt members into giving by threatening divine retribution. But, maybe we shouldn’t jump to conclusions about the purpose of the parable. Rather than treating it as an example story, maybe it’s a cautionary tale about economic exploitation. 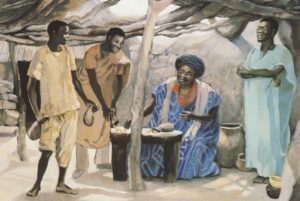 Could this be a reversal of expectations, so that instead of the third servant being wicked, Jesus might be using the third servant to call into question the landowner’s ethics, as well as the reigning economic system, which often took from the poor and gave it to the rich. What was true then is also true today. The rich get richer, and the poor get poorer. As we think about Jesus’ message, it might help to translate the word “talent” into its modern financial equivalency. Based on what we know of first century economics, even the servant with one talent got a lot of money to invest. One talent would be the equivalent of about $600,000. We might look at this as venture capital, which the landowner entrusted to three managers to invest during a period of absence. The owner, of course, expected to reap a reward upon return. The first two managers got busy, invested the capital, and achieved growth. But the third manager let fear get a hold of him. What if growth didn’t occur? What if the investment lost money instead of making it? What would happen then? Once fear took hold, the third manager decided to play it safe and bury the money in the ground. That way, the owner would get back the full investment. Yes, that’s the safe bet. Besides, it was common practice to hide money in the ground to protect it from thieves. Even today people will bury gold in the back yard, because they don’t trust the banks. What if this is a word of wisdom about the dangers of economic exploitation? Many of the working poor—people who live paycheck to paycheck— will understand the realities of economic uncertainty and the fear that it produces. Sickness or injury could lead to bankruptcy and even homelessness. A divorce or a job loss might throw a family into poverty. Jesus often spoke about injustice and the need to care for those who are poor and marginalized. So, what if this so-called “wicked slave” is really just afraid of the consequences of living in an economic system that exploits our vulnerabilities? If, so where is Jesus in the story? And, what would Jesus have us do? How might we participate in creating a climate where every person can flourish, without fear of falling into poverty and despair? What steps might we take so that our communities might be transformed, and the income inequality gap could be narrowed? As we pause to give thanks this week for God’s provision, how might God be speaking to us? There is another layer to this story that speaks to how we live in the interim. This layer invites us to consider how we as followers of Jesus will invest in the coming realm of God. Like the parable of the Ten Virgins, this parable has a future orientation. In this story, Jesus invites us to consider the part we will play in the revealing of the realm of God on earth as it exists in heaven. We hear the word that to each is given a measure of grace. The question is, what will we do with it? There is, of course, a stewardship element to this question, but there’s more to it than that. It has to do with how we live as the people of God in a world that is broken and cries out for healing grace. The question is, are willing to invest ourselves in this mission of Jesus? Investing involves a degree of risk. Every investment broker will remind the prospective invester that past results are no guarantee of future success. Many people have invested at the top of the market and then lost everything in risky ventures. Wise investing involves mutual trust. What is the difference between the responses of the first two managers, and the third one? Each is given a measure of grace, but the first two invested their capital, but the third one buried it. Why did the third person think that the master was harsh and reaped where he didn’t sow? Is it possible that the third person misread the master? Perhaps! Even if we don’t equate the landowner with Jesus or with God, maybe the parable does invite us to think about how we view God. Parents have often put the “fear of God” in their children to get them to behave. Churches have used the fear of God to get people to join committees and turn in their commitment cards. But fear only gets you so far. It could lead a person to bury gifts of grace in the backyard. I just finished reading a book titled “Building the Good Life for All.” It’s a book about the challenges of income inequality in our communities. The author offers some suggestions about how churches can contribute to the transformation of our communities, through relief efforts, self-help efforts, cultural transformation, and advocacy for governmental action. The author points out that the way in which businesses treat employees can effect productivity. He points out the benefits to businesses that embrace “progressive wages, advance notice of assigned shifts, better training, and other incentives for employees.” There is a financial cost, of course, but there are benefits to everyone involved. In fact, there are also significant costs incurred when employers treat employees poorly. These include “higher absenteeism, tardiness, lower morale, shoddy service, and high turnover.” [Jung, Building the Good Life for All, pp. 82-83]. Fear will get you only so far before it breaks down. Trust, on the other hand, might get you a lot further. When it comes to investing in the coming realm of God, we will need to take some risks. That will require being able to trust God’s faithfulness and love rather than live in fear. If we’re going to embrace the message of the parable, and see it as a word from God, we might want to set aside the final verses, where the master tosses the third servant into outer darkness. I’m not sure that this is a good motivational tool for servants of God. Instead, let’s focus on the responses of the first two servants, and the blessings that come to them. They received more responsibility, because they trusted the master to be fair and just. We have been entrusted with gifts of grace. We are part of a community that has been blessed by God’s abundance. In light of Jesus’ departure, and commission to us, how will we live in the interim? How might we make use of time and resources? In the words of Hugh Kerr’s hymn, may we sing with boldness: “God of the coming, years, through paths unknown, we follow you; when we are strong, Lord, leave us not alone; our faith renew. Be now for us in life our daily bread, our hearts true home when all our years have sped.” [“God of Our Life,” Chalice Hymnal, p. 713]. Picture Attribution: JESUS MAFA. Parable of the Three Servants, or, The Talents, from Art in the Christian Tradition, a project of the Vanderbilt Divinity Library, Nashville, TN. http://diglib.library.vanderbilt.edu/act-imagelink.pl?RC=48297 [retrieved November 18, 2017]. Original source: http://www.librairie-emmanuel.fr (contact page: https://www.librairie-emmanuel.fr/contact).